These photos of Ram Charan, Jr NTR and Mahesh Babu that have been going viral for a while now show the camaraderie between the actors and their families. 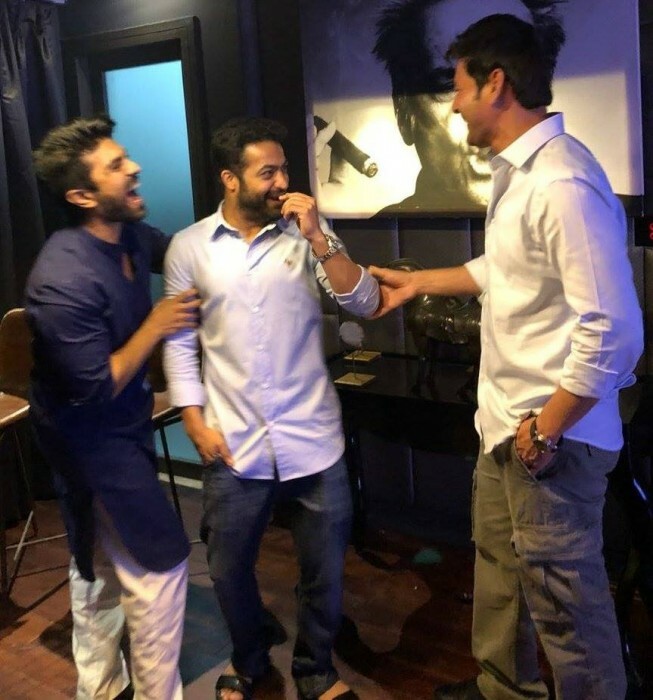 In the last few weeks, many photos of Jr NTR, Ram Charan and Mahesh Babu bonding have been doing rounds on social media and fans of Telugu cinema – specially the three stars – have are loving this brotherhood between the actors. And the latest picture to go viral on various platforms of social media is a treat for the fans. Ram Charan, Jr NTR and Mahesh Babu were caught in a candid moment and this photo is worth millions, feel fans. These photos are doing rounds on various platforms at times when fans of various actors are often found locking horns in debates and arguments about who has the top hand in the industry. These photos of Ram Charan, Jr NTR and Mahesh Babu that have been going viral for a while now show the camaraderie between the actors and their families. And the latest one is more special because it has happiness written all over it. Interestingly, there is a common thread between these three stars who are in the news now – producer DVV Dhanayya. Mahesh Babu’s latest outing Bharat Ane Nenu was bankrolled by Dhanayya and SS Rajamouli’s upcoming multi-starrer with Jr NTR and Ram Charan is also being produced by himself. And this brings all these three stars together making fans a happy group. And recently, actor-politician Pawan Kalyan attended the audio launch of Ravi Teja starrer Nela Ticket and the bonding between the two was something never seen before. Always found to be a calm and not-much-speaking Pawan Kalyan was seen having a great time at the event and making of Ravi Teja too during the event. These gestures by actors in Tollywood is a sign of bonhomie in the film industry which not many fans are aware of. And with changing times, hope fan clubs too display similar brotherhood.